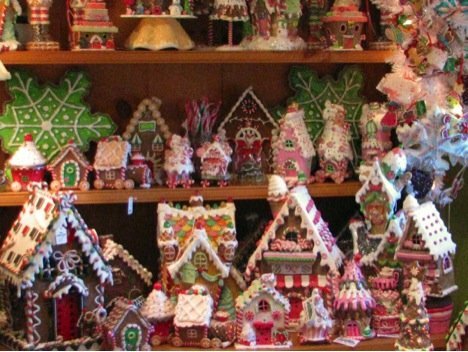 The Arbor Gate is all about the holidays; the elves have been working hard to make our gift shops a Christmas Wonderland filled with an amazing collection of gingerbread houses. In celebration of Christmas and all its deliciousness, I have the most delicious powdered sugar gingerbread cookie recipe for you to try. The powdered sugar looks amazingly like snow on the little round chewy cookies (chewy cookies are the best). They make the perfect treat for your family after all that shopping madness on Black Friday. Heat oven to 375 degrees. Cream Margarine and Sugar together. Add 2 eggs and molasses. Mix well. Sift remaining dry ingredients together. Gradually add to creamed mixture, stirring constantly. Shape into one inch balls and roll in powdered sugar. Place on ungreased baking sheets 2 inches apart. Bake 15 to 18 minutes. Cookies are soft and chewy if they look moist in the cracks. For a crispy cookie leave in the oven until the cracks look dry. , she was unrealistic, irrnaioatl, inappropriate, and over the top. Forgive me if I was unclear, but my point was that your timing in the delivery of this information could have been improved. Even waiting until after she finished her sandwich would have been better than bringing it up immediately after she ordered it. Take away the yelling, the excessive google-searching, and the 5hr first date expectation, and you still put yourself at a disadvantage. Who needs an hour of warning that their date is going to end unless it means you have to stop drinking? You could have done all the right things and handled it with nothing but finesse, and she probably would have reacted the same way because she is crazy. However, replace her with someone more sane, and you still, at the very least, deflated her confidence in how the date was going. My unsolicited advice? If you see no reason to tell them beforehand, wait until there's a suggestion to move the date to another location, or when you're winding down to the last 10-15 minutes of your time frame. It's a lot more natural (and beneficial) to tell your date something to the tune of, I didn't expect this to go so well, or I totally lost track of time, than it is to tell them that they have an hour before their time is up. Assuming you want a second date, that is. Otherwise, tell them whatever you want.